You have most likely seen her viral videos. Doreen Ketchens, the wonderful, inspiring clarinetist playing in New Orleans’ French Quarter with her group. Like you, I was transfixed as I heard her style, her power, her heart. I felt compelled to find her, to compliment her, to find out how she does what she does, and to hear more about her work and her life. I googled her, and found her website, and voila, instantly connected. Her story is there too, along with images of her world, & her beautiful countenance. 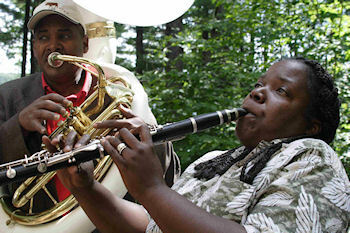 According to her website, Doreen and her husband Lawrence not only play on the streets of New Orleans, but have worked with Jazz at Lincoln Center and The U.S. Department of State to teach the traditions of New Orleans Jazz to children and adults in schools and universities around the US, Asia and Africa. They have received rave reviews from newspapers, magazines, radio and television programs including HBO, VH1, PBS, BET & MTV. There’s plenty of merch on the site to purchase, including albums that date back to the early 90’s. Doreen worked her way through college as a chef, and offers a “ Dinner and Music ” option on her website. 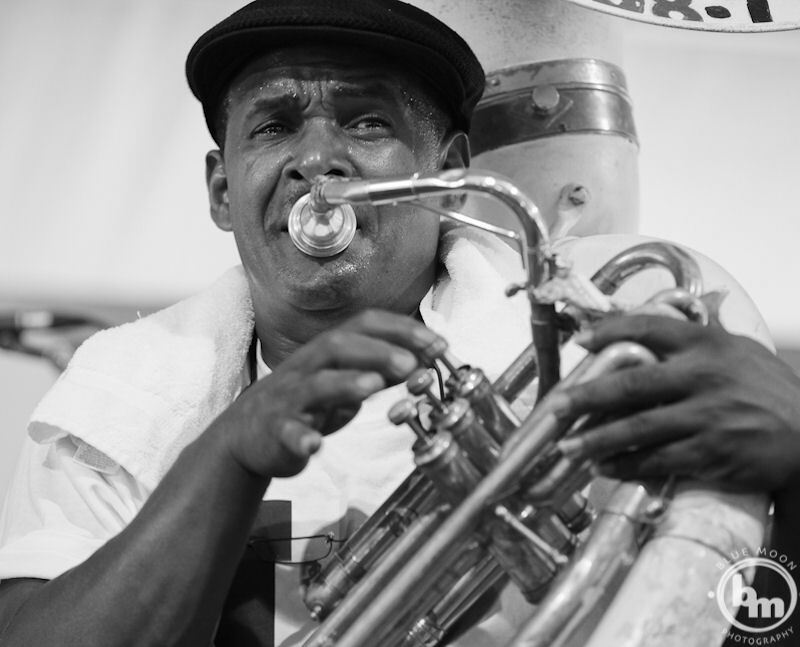 It’s described as a full circle New Orleans experience. Not only does the audience receive a great Doreen’s Jazz signature concert but they also are treated to one of many classical New Orleans entrees from the familiar, i.e. Jambalaya, Dirty Rice, Red Beans w/rice and Gumbo, to the unexpected, like Creole Stew and Braised Rabbit. The website lets you know all about the experience. “These meals are not just thrown together, either. They are full of the love and experience that Doreen has learned through working living and eating food.” Sounds like quite a deal at any price. Doreen & Lawrence doing their thing. I’d like to see full venues and professional accolades for this wonderful artist. Doreen is a master of the clarinet, a rare & exciting artist. She and her rootsy group are a New Orleans original. With the groundwork having been laid by her success on the internet, I hope that she can begin filling concert houses & arenas. It’s time for her to create a Grammy-winning recording that ends up in everyone’s music library. 1) I heard that you are a classically trained musician, (and that you worked your way through college as a chef?) and that jazz came later. Can you tell us about your school experience, and how you came to play jazz so well? DK – I studied at N.O.C.C.A, Loyola in N.O. and The Hart School in CT. All classical studies. However the schools didn’t do it. My concepts come from Stanley Weinstein. He was the principal clarinetist after Larry went to Chicago. People say I am great but I am no Stanley. I’m still trying to get there. Didn’t try Jazz until I fell in love with a Tuba player at Loyola. (Lawrence H. Ketchens II, my Husband). Learned the Jazz on the streets by getting battered and broozed by Jazz clarinetists and saxophonists. And by listening to Lawrence tell me how good I wasn’t but could be. Applied what I knew to what I was trying to learn and there you have it. I think what people like so much is the fluency. Stanley always stressed the importance of every note no matter how short. I think of that always. He is proud of me and that makes me work even harder. I think he was the best of all my teachers. I also studied with Hank Larsen when I went to UHart. He had been the principal clarinetist with Hartford before he got sick. He could no longer play by the time I got there but he had a way of explaining things that was unmatched. Cool Cat. However, before Stanley and Hank there was Donald Richardson. He was my junior high band director. He would call on me to demonstrate musical passages on my instrument because he knew I was lazy and couldn’t do it. Well one day I just got tired of being laughed at and actually practiced. The stuff was so easy, I was ashamed. Well, went to school the next day, played up a storm, became the teacher’s pet and had confidence like never before. Had so much confidence that by the time I met Walter Harris in Sr. high school, I had become a jr. jerk. He killed that with kindness and knowledge. He was a big part of my sensitivity. How did you develop your distinctive signature style? DK – My style comes from God. It developed through playing around lots of brass horns and trying to be heard. I think that’s where the volume comes from. The power and emotion is a mixture of appreciation and anger. Thankful to God for the talent, wonderful family, friends, fans and a venue to express myself musically and earn a decent living. The anger is from the unfair treatment I get from the establishment. (People with abilities to help you but try to hide you instead). New Orleans is full of crabs in a barrel. It’s hard enough for a woman who’s not a pianist or vocalist to break in to Jazz. It’s even harder to call yourself a band leader and get help or respect. I have gained respect through my playing. After a while, they can’t look over you because everyone else is looking at you and asking for you!. DK – I practice on the street before and between sets. I get a good bit of practice in when we are on tour. Not enough but at least a little. What’s important to you regarding playing goals? 2) Can you speak about playing on the street? DK – It’s hard. You have to deal with every element of society from the neighbors, bums, & criminals to the police. All of them hassle you from time to time. Is working on the street in The French Quarter your primary source of income? DK – No, it’s a good percentage but we do plenty of gigs throughout the year. DK – The roof leaks. You have included a 9 year old drummer, Dorian Ketchens – Dixon in the mix, how are you related and how does she like being out there? DK – Dorian will be 12 this Friday. She says she doesn’t like playing the drums, she just likes the perks. She loves flying to other states and countries. She loves the hotel rooms, room service and all of the attention when she plays on stage. I’ll say this, it doesn’t matter how big the audience, when it’s time to play… she is going to play and play very well. Our daughter is truly a gift from God. 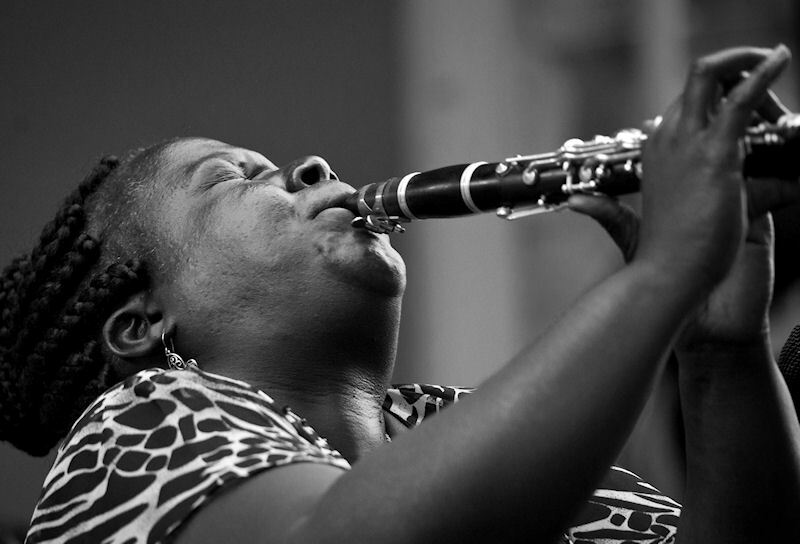 3) There is such a rich history in New Orleans on the clarinet: Jimmie Noone, Jimmy Dodds, Irving Fazola, Barney Bigard, Victor Goines, Edmond Hall & now Doreen Ketchens – Who are the players, living or from the past, that you admire most and why? DK – Louis Armstrong, Louis Armstrong, Louis Armstrong, Buster Bailey, Capt. John Handy, Barney Edmond and Fats Waller. Louie because he is the Father of all Jazz musicians during and after him, Buster because his background is like mine, Barney and Edmond because they speak well and have good tones and Fats because he seemed to be me on the piano. Will you describe your equipment setup; make/ model of instrument, make/model of mouthpiece, reed, ligature and why you prefer them? DK – Nothing special, Selmer gold plated clarinet, but I grew up playing Buffets and could be playing one next week. Standard Buffet mouthpiece that was worked on 25 yrs. ago by my teacher, (Stanley W.) to fit me. Mitchell Laurie reeds and any metal ligature that holds. 4) Your videos have gone viral. Are you aware of your popularity? DK – Not really. What should I do? What is the best thing to come out of your experience being so public on the internet? DK – Lively hood. So many fans, friends and family saying such wonderful things… It’s amazing! They love me and I love them. I wish I could find a word greater than thank you. I thank God all day, every day and pray for more success than I can even dream. I would like to fill theaters, auditoriums and even stadiums in the future. Maybe God has it in the plan for the internet to help us do that. One things for sure… I didn’t expect this much and I’m having a ball! 5) You have many albums dating back to ’94 for sale on your website www.doreensjazz.com. How do you find the budget to record, and do you have any new recordings in the works? DK – We are on the streets and people come year after year wanting something new so when we make enough money on one, we do another. Yes, we have volume 23 coming out at Christmas.